In 2008 a year-long study was conducted where a group of people with chronic lower back pain had a series of Alexander lessons whilst another group had regular massage and another group didn’t have either. Not only did the group having Alexander lessons have statistically significant improvement in their lower back pain by the end of the course of lessons, they were the only group to be found to have lasting improvements when they were followed up a year later. 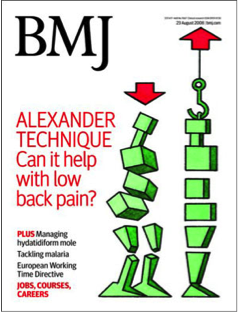 You can watch this 9 minute video to find out how the British Medical Journal (BMJ) concluded that the Alexander Technique not only helped with chronic lower back pain in the short term but that the improvements were sustained one year later. "For eight years I had constant back pain of varying degrees due to spinal disc problems and narrowing of the spinal canal. I had deteriorated so much that I could only walk short distances with a stick.. I had also lost all my confidence. None of the treatments through orthodox channels helped in any way. I do not remember what led me to the Alexander Technique but I knew from the very first lesson with Penny that this was a worthwhile technique to pursue. In a short time I began to notice some changes such as less pain and the big breakthrough came in a few months. As I reached for my stick I suddenly realised that I did not need it. I just could not believe it. It is now nine months since that day and I have maintained a gradual improvement. I have times of being pain free and I no longer require pain killers. I am convinced that if I had not discovered the Alexander Technique I would probably now be housebound." "My back pain disappeared completely after a few lessons. I feel taller and more confident. It has gone a long way to making me more laid back and less immediately reactive. I am less tired and I am more aware of what my body is doing." "I used to wake up creaking like an old staircase. While learning the Technique, the morning aches disappeared. As my work involves a lot of lifting, my back pain was especially worrying. Through the classes my back has improved greatly. I feel that learning the Alexander Technique has helped my future as well as my present. Apart from being beneficial, the classes are enjoyable. It would be hard to find a teacher more informed and dedicated than Penny and I would have no hesitation in recommending her." "The Alexander Technique has not only improved my posture which pleases me greatly but also very importantly it has almost elliminated the body ache which I experienced as a result of my working position." "As a result of the limited time spent with Alexander Technique, my back and leg problems were substantially eased and eventually pain and awkwardness in various basic movements disappeared entirely. It has taught me to be more 'upright', more 'inhibited' [in the Alexander sense] and to lead with the head. Driving, guitar playing, my golf swing - in fact all my general activities have benefitted greatly and I feel taller." Mr C.L. - Management Consultant. "I did a series of Alexander Technique lessons with Penny over a six month period. I went initially because I was aware that I had a stooped posture. I had no idea what to expect, but I immediately felt comfortable with both Penny and the Alexander philosophy. The thing I love about the Alexander Technique is that it showed me that using my body properly is a natural gift - not something that has to be forced. I also learned that when my body was being used properly, I felt much happier in myself, more confident and open. But I think the biggest pleasure for me was walking into Penny's house feeling all scattered and full of busy thoughts and leaving feeling still calm and centred." When I apply Alexander Technique, my body becomes more supple and I am able to bend, walk uphill more easily and relieve lower back pain. Also I have better balance.